A virtual firewall is a virtual appliance (virtual software) running as a virtual server that controls and filters communication to virtual servers, from virtual servers, and between virtual servers. Virtual servers need to be protected via physical and virtual firewalls. The data, virtual servers, LUNs and networks of different cloud consumers need to be isolated so that they cannot access each other’s services. Encryption mechanisms need to be used to protect the virtual servers’ disk content. This prevents someone who has gained access to the virtual disk file from being able to access the actual data stored inside the virtual disk file. Unnecessary services need to be disabled. Virtual servers can be deployed from a hardened virtual server image. In Figure 1, a virtual firewall and three virtual servers are hosted on the same hypervisor. Traffic is received and inspected by the virtual firewall before being forwarded to and from the virtual servers. 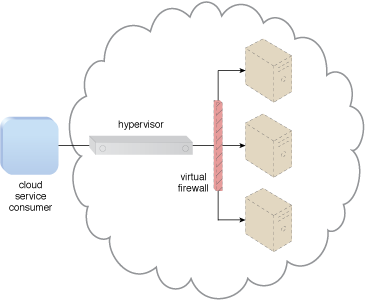 Figure 1 – A virtual firewall example.